100% American / Canadian Maple Does NOT Mean Made In The USA! One of the top skateboard manufacturers in the industry today making skateboards for some of the hot new up in rising brands in the market. We know what it takes to make a great deck and it is not importing from overseas and slapping a graphic on it like our close competition. They won't advertise it but if you ask and if you see the color of the wood you will know that it is a lower quality product. 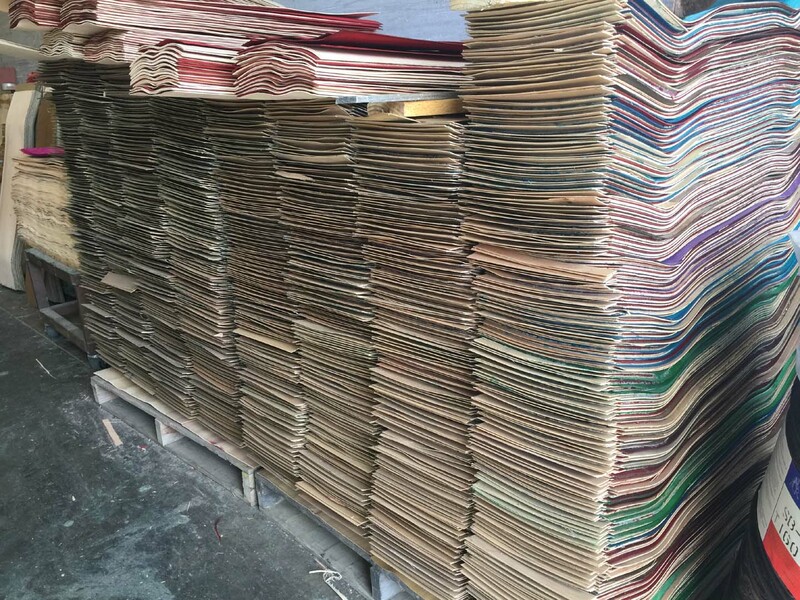 From the glue to the wood we manufacturer the highest possible skateboard deck in the market. With labor and materials going up on a regular basis we have invested any money made into new machinery and equipment to keep your cost down. You can say we have invested into the market by starving our income to ensure the everlasting sport as we know it today. 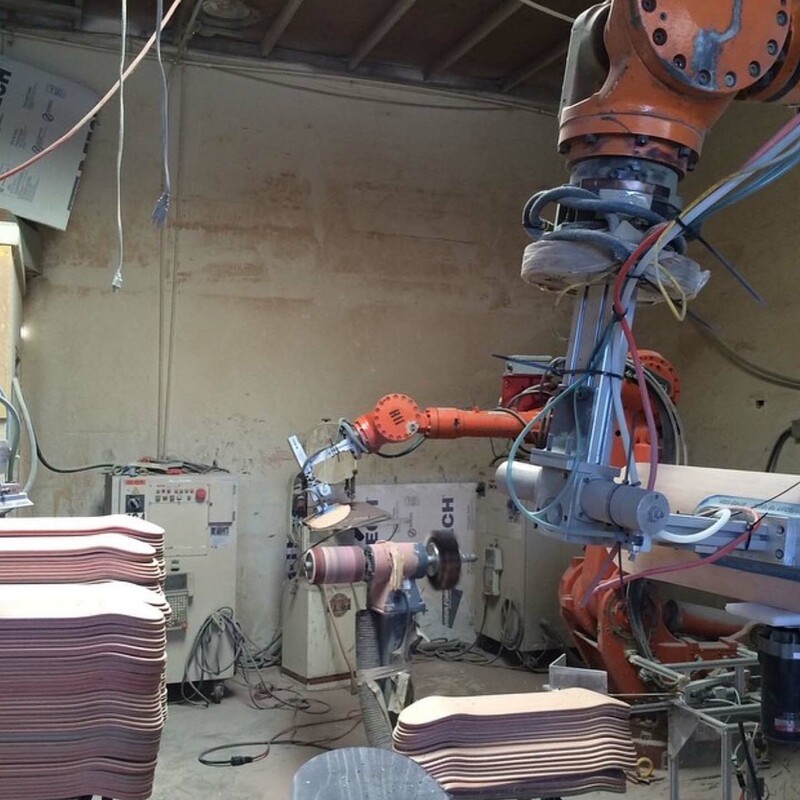 Our automated machinery for manufacturing skateboards and longboards is state of the art and can be programmed into making any shape size and dimensions you request. Bulk orders is a big part of keeping the doors open to the single one off deck orders we are doing for you with this site. Start your own brand faster and without the huge investment by setting up a free online skate shop on our site. 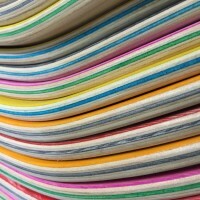 From the ground up our printing skateboard process is top notch. We start with all the raw materials to create a one of a kind digital heat transfer technology. 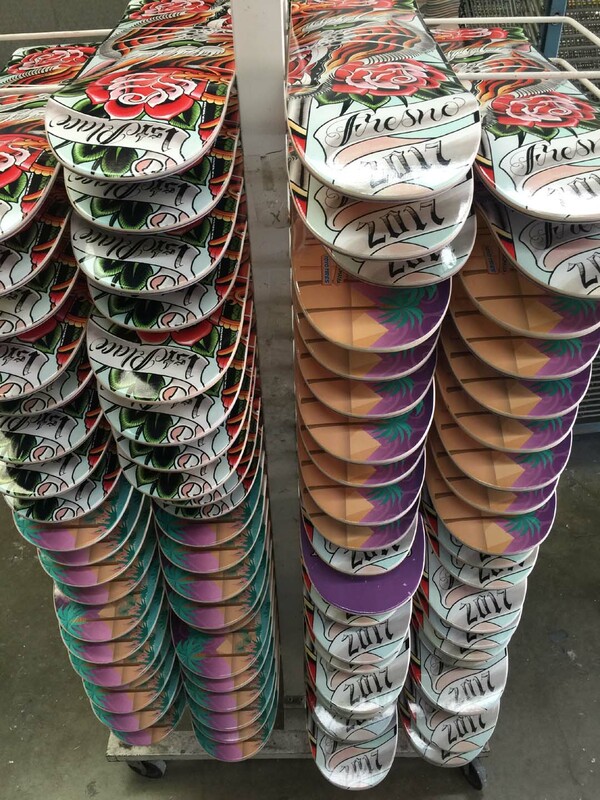 We print all of our skateboards in house with ink that last longer then most heat transfers that are made by other suppliers. 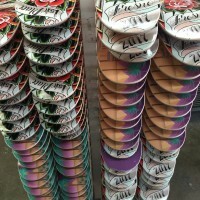 We can screen print top prints and the bottoms of the decks at an additional cost. Most customers use our digital heat transfers so there is no setup and no limit to colors. We use a cold press when manufacturing our skateboards. 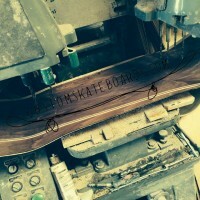 This allows for a good lamination process to ensure high quality skateboards. 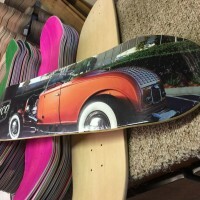 Most manufacturers will use a hot press because they like pressing one skateboard in a press to ensure the concave is the same on each and every board. 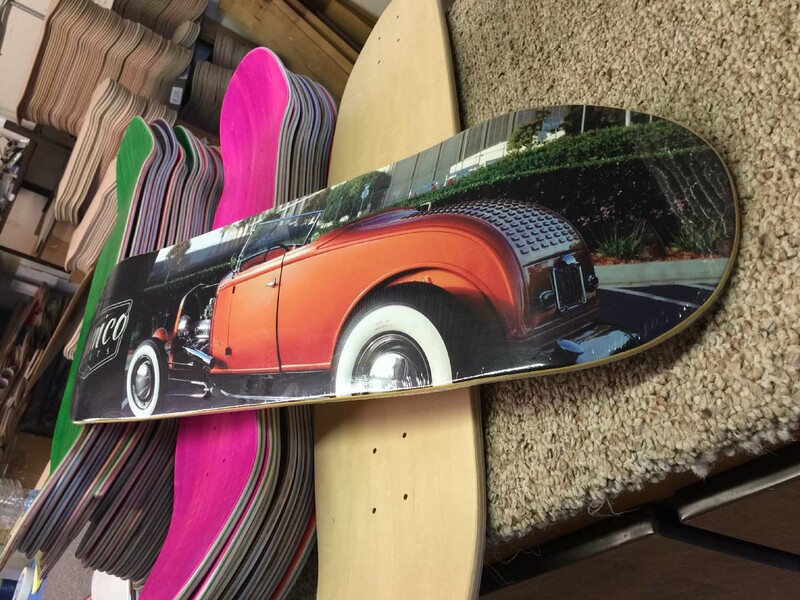 Manufacturers Skateboard Printing SpecialThis is your factory direct Manufacturers Special Discount ..
​SALE 1-$40 LIMITED TIME ONLY! BULK AS LOW AS $13.00 Sizes ranging from 7.5 to 8.5Make ..
SALE 1-$40 LIMITED TIME ONLY! BULK AS LOW AS $17.00 Sizes ranging from 7.5 to 8.5. .. In design studio you can pick the sizes 7.5 7.6 7.75 7.8 8.0 8.125 8.25 8.5Make your own custom sk.. 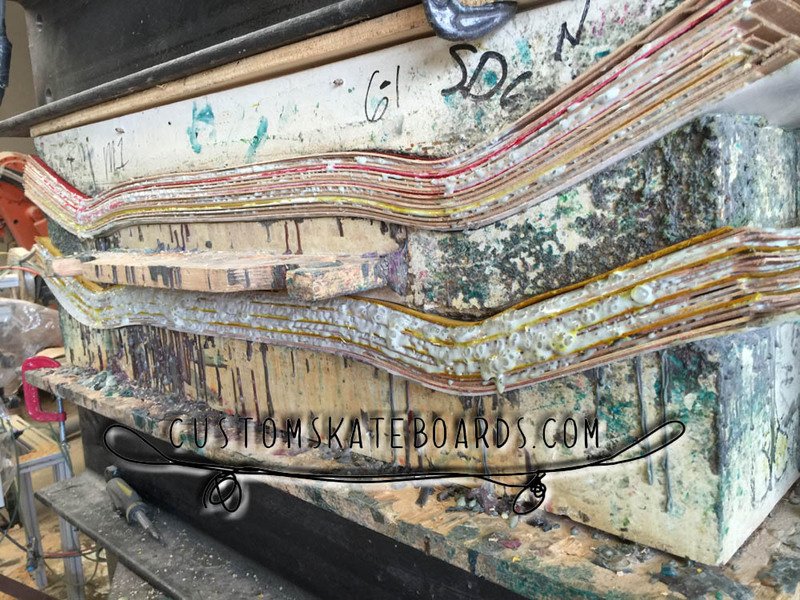 In design studio you can pick the sizes 7.5 7.6 7.75 7.8 8.0 8.125 8.25 8.510 Custom skateboards w.. When In design studio you can pick the following sizes 7.5 7.6 7.75 7.8 8.0 8.125 8.25 8.5All sk.. 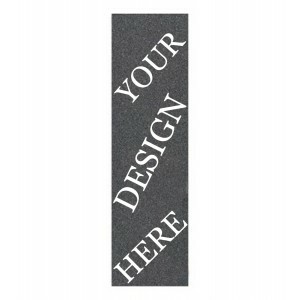 Custom Printed Skateboard Griptape with your designs and logos. 9x33 inches sheets can be orde..
We make this Coffin deck for many different brands and individuals. It is a great conversatio.. 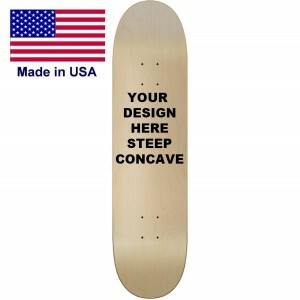 Sample Skateboard Deck made with your graphic. We pick a size ranging from 8.0 to 8.5 if you w..
39" Long10" WideOne of a kind longboard with your graphics made for you on this freeride shape.. 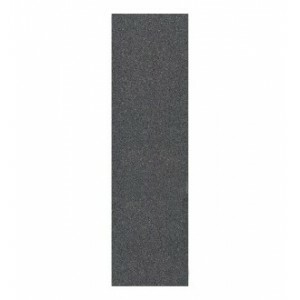 These 8 inch wide blank skateboard decks are perfect for the skateboarder that wants quality under.. This is the most popular size deck on the market. The 8.25 skateboard can be made to order.. The 8.5 Skateboard is growing in popularity. We Glue Cut and Paint these quality skateboards a..
8.38" Inches Wide32.5 Inches Long14.25 Inch WheelbaseThese decks come with a Stain top&nbs..
Assorted Stain Top and Middle ply. 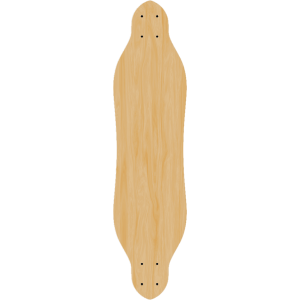 This 7.75 inch wide blank skateboard can be sold in bulk o.. 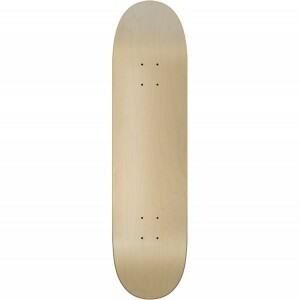 This 7.5 Blank skateboard deck has a length of 31.75 and a 14.25" wheelbase . 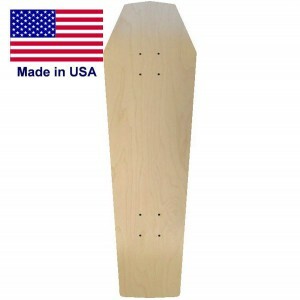 Nose ..
7.8 inches wide31.8 inches Long14.25 inch wheel baseThe 7.8 wide skateboard blank is a per..
8.125 Inches Wide32.5 Inches Long14.25 Inch Wheel BaseThe 8.125 blank deck is a popular si..
We stand out from all the other Manufacturers offering no minimums and the lowest price on American made decks. Our manufacturing equipment was designed and manufactured according to strict tolerances set by the owners engendering background. The press and molds built to withstand the extreme pressure and allows us to close and open the mold fast for a quick reload. We start with the press using a 7 ply hard rock Canadian Maple Veneer. The process of the veneering is extremely important. 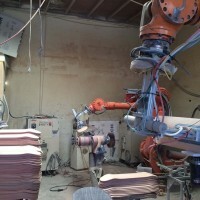 The mill has to know how to process the veneer properly in order to make the best quality deck. 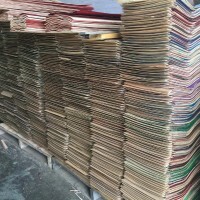 A skateboard veneer supplier does not know how to make the decks they specialize in the veneer manufacturing process. We work close with our veneer supplier and know the tricks of their trades due to the testing of the decks we make with each and every setting they use to peel the wood from the logs before sending it to us for the gluing phase. The most important parts of the manufacturing process is the glue. 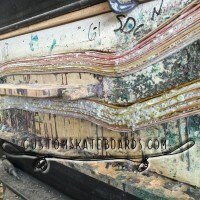 We use glue developed by professional skateboarders along side the supplier. With a growing trend of companies using the same glue you can find at your local hardware store just under a different name. We tested this glue and found it to have a higher viscosity with more squeeze out under pressure. The glue we use is thicker in viscosity and more will stay inside the lamination. All the shapes are stored on a computer. Back when we started we had wooden templates we used to cut the shape. This old style of shaping skateboards was good at the time and had its drawbacks. The templates would wear down and affect the shape of the decks. With a CNC Router we get to keep the shape the same each and every time we cut boards. 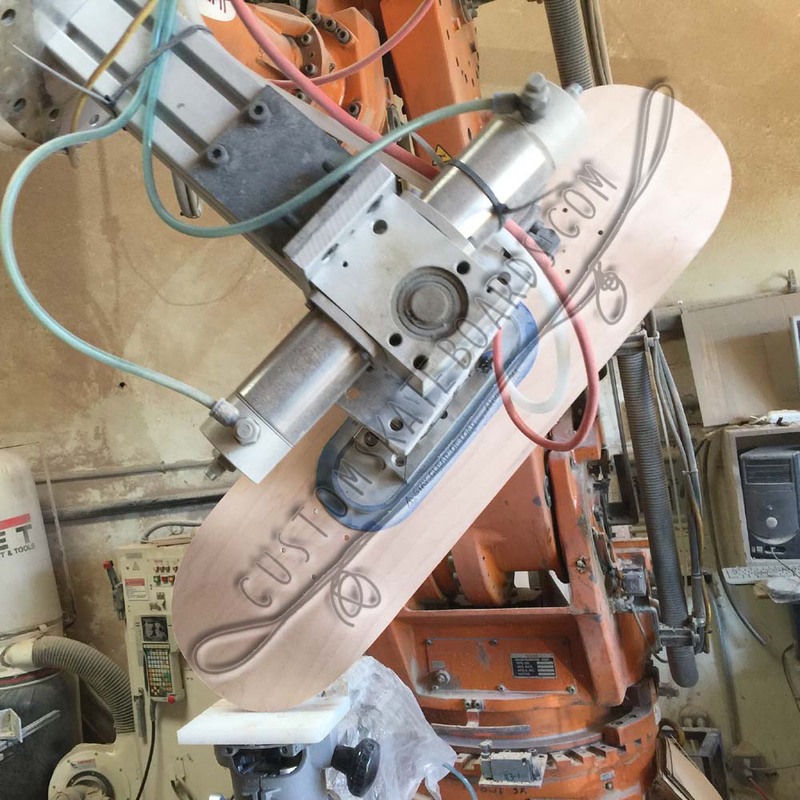 You can have us program a CNC file to cut your custom skateboard shape. We don't send it out to any other place for production so your one of a kind shape is safe with us. 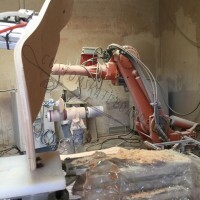 Allowing computers to control cutting and sanding tools has introduced higher level end result. Being able to reproduce a tool path the same for each and every deck allows us to control quality with extreme precession. 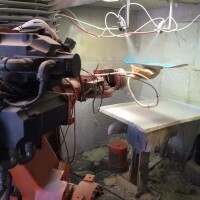 With years of experience making skateboards we have kept the machining process at the top of our list. There is a strong driving force keeping us up to date and exceeding in the manufacturing of a skateboard. We are proud of our machinery and what sets us apart from the rest of the manufacturers. Taking the building of a skateboard to a higher level with automated systems took years to develop. The engineering and knowledge we have enabled us to set up a factory that can run by itself if need be. The use of labor in our facility is more focused on quality control other then back breaking repetitive tasks. 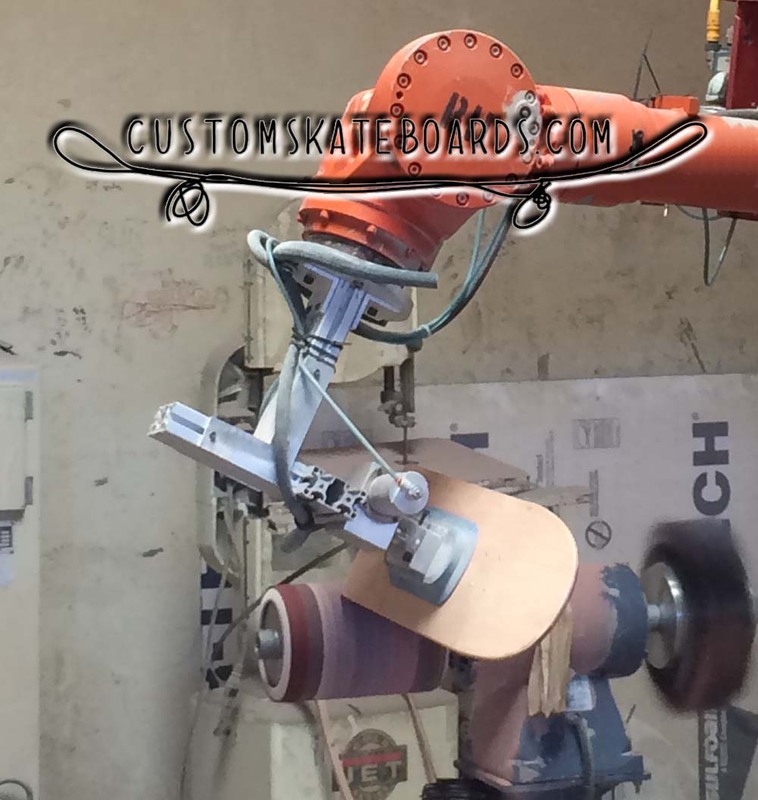 We use automated programmed robotic machinery to break the edge on the skateboard rails. This step in the process gives us extra time to check over the final product before sending it to the painting phase. It is a bit of over the top but looks really cool when it is in motion. There were other automated versions of this step in the manufacturing process. This version takes up a ton of space in the woodshop. 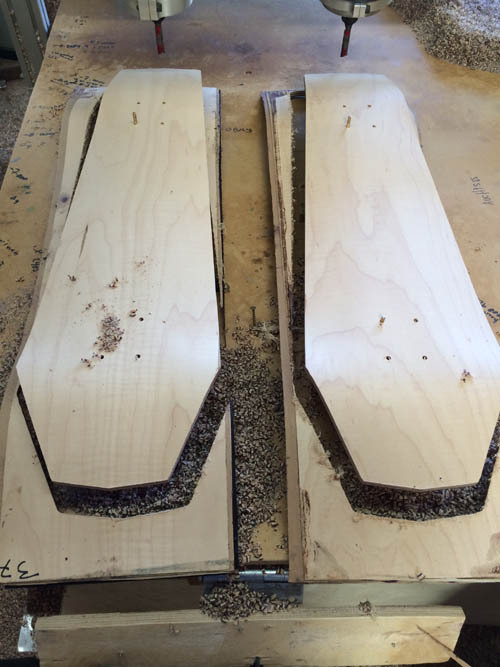 We are always looking for faster and better ways to eliminate steps to manufacturer skateboards. Getting the decks ready for sanding the rails smooth is an important task. Without a radius bit cutting the sharp edge off the rail of a skateboard it would take a ton of time and sandpaper to make the rails round. When using a skateboard the radius on the rail of a skateboard help the ply from chipping. We have been told many times how our rails hold up longer and don't chip like some of the other top brands in the market. Years of planning and prepping for a solution to one of the hardest positions in the factory and we nailed it. I know how hard it is standing in one place sanding skateboards in a 8 hour shift. It only takes about 50 decks to start making your back burn in pain from sanding the decks by hand. Our longtime employees were so happy once they did not have to sand the rails of decks anymore. 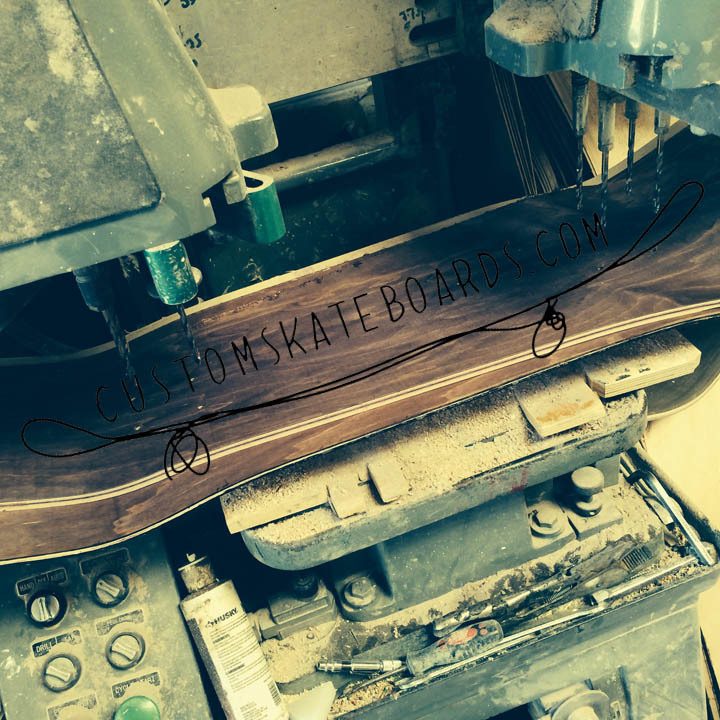 With a background of engineering and designing systems to help any type of manufacturing process we have what it takes to produce a skateboard at the best price. You can find decks at a better price but the materials are not even close to what a USA manufacturer has access to. 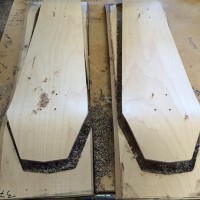 The more we take the human element out of the steps of making skateboards the more we can put it back into the final quality control inspections. 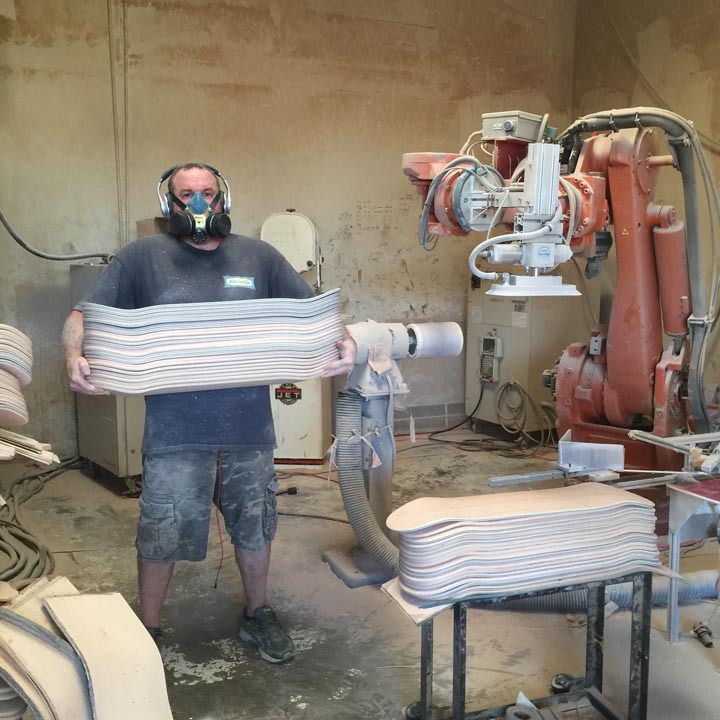 Many factories use hundreds of workers just to sand the rails of the skateboards. This is one of the most time consuming steps in the skateboard manufacturing industry. While we watched factories close down here and abroad we did whatever we could to keep bringing you quality decks. In order to do any kind of automation in the skateboard industry there has to be exact placement. Without the high tolerances the risk of a collision and breaking machinery is possible. With all this said about how we make skateboards you can trust that the quality of the decks is as good or better then the top brands. 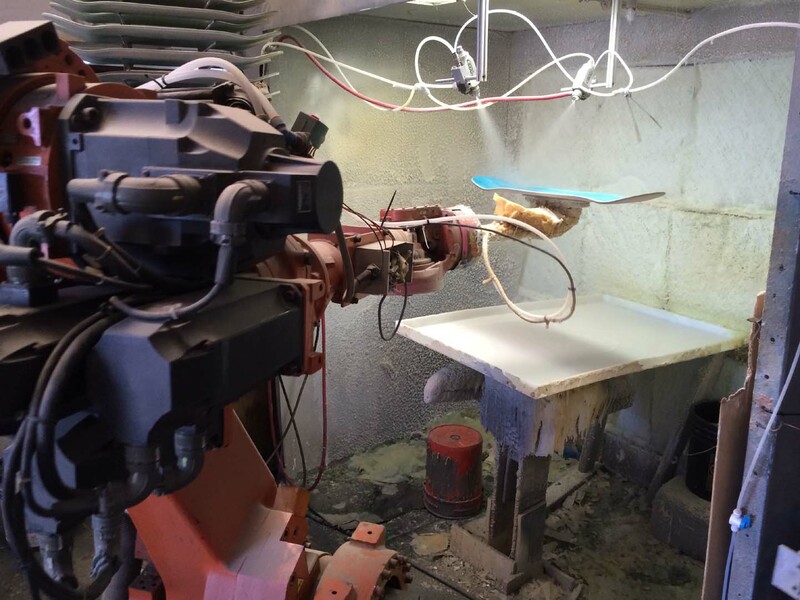 Another trick to our trade is how we use automated equipment to lacquer the skateboard decks. Its all about being efficient that keeps your cost down. Unlike most manufacturers all the investments we have made has gone right back into the manufacturing process to keep the rising cost down. We are dedicated to helping the skateboarding industry grow. Ths cost of paint goes up each and every time the fuel prices go up. It fluctuates like the weather but your prices for decks have remained the same since we started making boards over 20 years ago. Not only does our paint price rise every year but so do the labor, wood, and glue expenses go up. We have been able to maintain the same price for a deck because we are always staying on top of the latest and greatest technology. If you need decks without paint no problem you can request us not to put a clear coat on them. With the ability to build a skateboard from scratch we can scale our daily volume output to cater to customers request. It is possibe that one day the big brands will bring their production back the American workers and we will be ready to meet those needs with the same or even lower prices then importing. 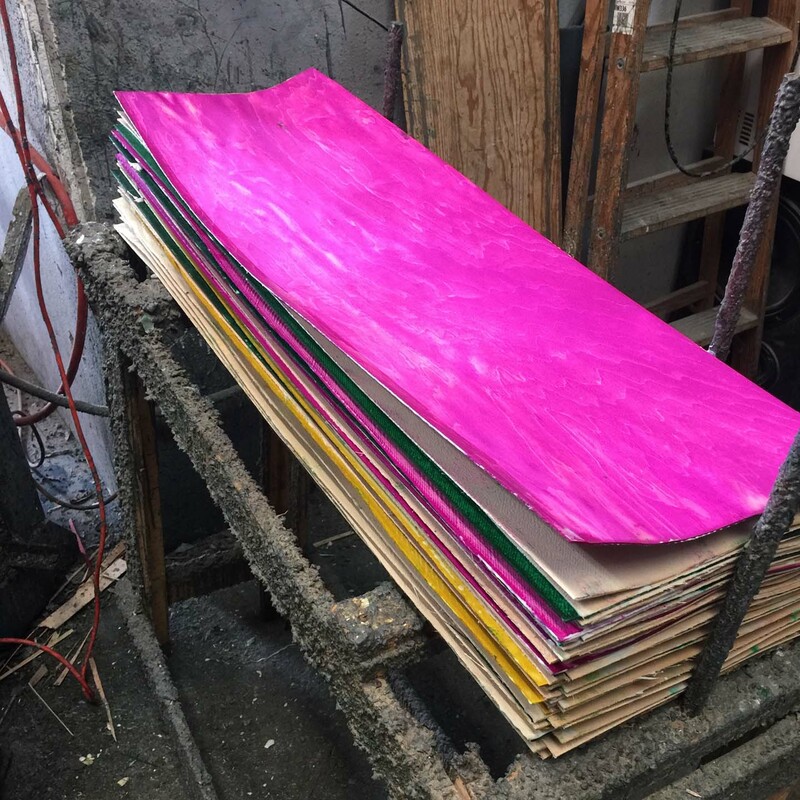 We are environmentally friendly with using paint for skateboards that does not produce any hazardous waste. 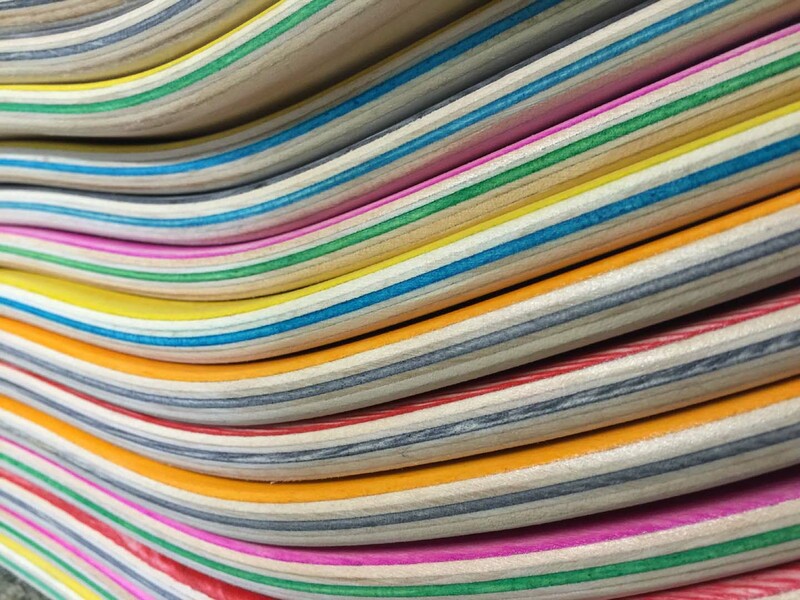 The lowest Volatile Organic Compounds (VOC) are used in the paint we use to manufacturer skate decks. Our Paint Booth captures any material in its filters before going into the atmosphere. We know you have seen the photos that come from the largest supplier in the world. They have to wear a mask outside and most days they can't see the person next to them. In the United States we have strict regulations on pollution and we are proud to be up above regulation standards. 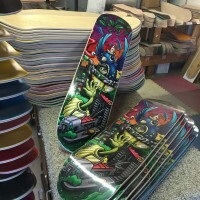 A leader in skateboard printing business for over 25 years. There are endless ways to print on a skateboard some of them we have not even introduced to the market. Turning dreams into reality has kept us ahead of the rest of the manufacturing sector. 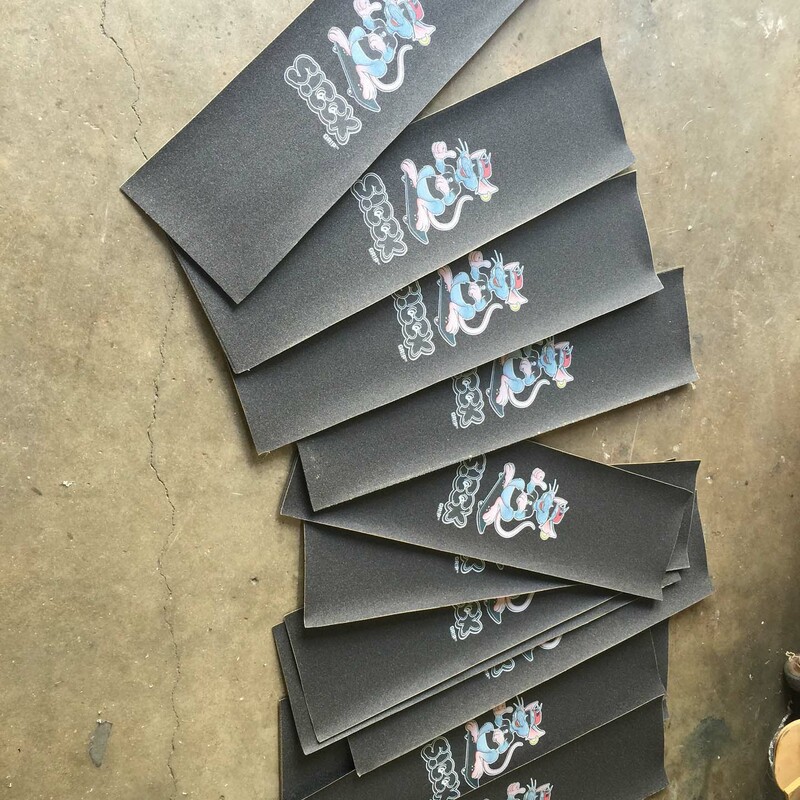 Mastering each and every traditional methods of skateboard printing has lead us to develop the digital heat transfer before any other manufacturer. While they are all working hard to figure out the digital process we are hard at work developing the next best thing for skateboard printing. Making it super easy and simple because we have been doing it longer. Lets keep it simple. All you have to do is export or save your file as a 200dpi jpeg file. Keep in mind that you want it to look like a skateboard before saving it. Keep the dimensions of your art 1/4 wider then the deck and 1/2 longer then the deck you are placing orders on. 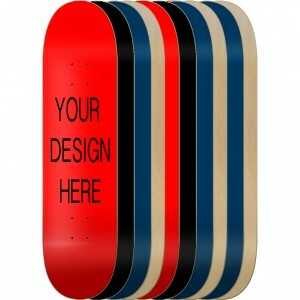 Here is a link to our template page you can download skateboard design templates here. We can print using anything you throw at us. Some like to draw art by hand and if you are going about it that way the following information will help you do it with the best results. First get a canvas or paper that is the length and width of a deck. Start your art and when you are done either take a good photo of it or have it scanned in. Most high end cameras will be able to get enough resolution and detail to get your deck reproduced with the exact same quality as what you created with your hand drawn skateboard artwork. Upload your file as a 200 dpi file and the length and width of the widest deck you are looking to manufacturer. As long as you created your art 200 dpi or higher you will be fine. We have tested decks printed at 200 dpi and 300 dpi there is no difference in quality so it is best to save or upload your art at 200 dpi. Speeds up your order and will look exactly the same as a 300 dpi saving you space on your computer and our servers. From time to time we get this question and it is the same answer you will get from most places. Simply as a manufacturer it is respectful to keep your information along with all of our other customers information private. Lets face it if you have the best deck in your area do you want your customers to know where the decks came from? The more you stand out with top notch quality decks the more you will sell. How to talk to someone that knows more then the rest? You will find that we have more experience in the art of making skateboards. This is based on that we actually manufacturer skateboards not just buy a deck and slap a graphic on it for you. 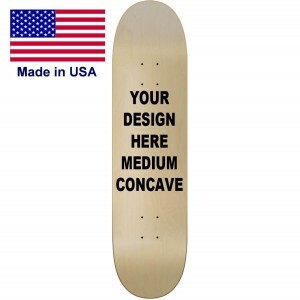 What is the point of paying more somewhere else and just getting a non USA made deck. If the supplier will not say it is made in USA then it is simply a lower end deck. We make them here as you need them and also if we have a transfer sitting here for years we can still make it work. We have more experience with making heat transfers then anyone in the market. While others say they will expire we say it will never expire. We do not sell heat transfers only make them for our intended customers to apply to the deck. If you have a good idea and you just don't know how to make art there are websites on the net that freelance graphic artist are posting their contact information on them. Typically a freelance graphic artist will charge 50 to 100 dollars for them to make up a graphic for you. Lets face it you have looked around and we know you do. Pricing is extremely important factor when making the decision to go with a manufacturer. Since we have been doing it longer we are more efficient at getting the job done right at the lowest price in the industry. 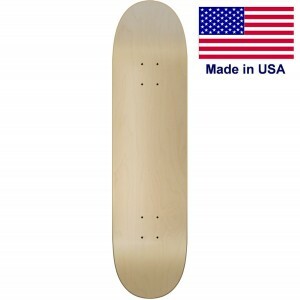 In fact we have not raised our prices since we started manufacturing skateboards back in 1995. We have a price for every situation and variations possible. You name it we have it at a better price then anyone else. The more you buy the cheaper it gets. You will find that with our design studio it will allow you to get multiple graphics in your order at the same price other manufacturers will charge for doing one graphic. Group your graphics and sizes together and see what hidden savings you will find on our site. Our price list grid in the main navigation will show you how low we go with volume. Here is the truth about what you are finding when you look for skateboard manufacturers on the web. There are a few companies that pop up when you are looking for your skateboard manufactures and a few of them don't actually make their own decks. We want you to know ways to find out if your next deck order is from a second hand source or directly from the manufacturer. First lets look at prices for companies listed in skateboard manufacturers. Most manufacturers are going to have a more competitive price then any other site. So make sure you shop around and be aware that some might have a better price due to using imported decks. 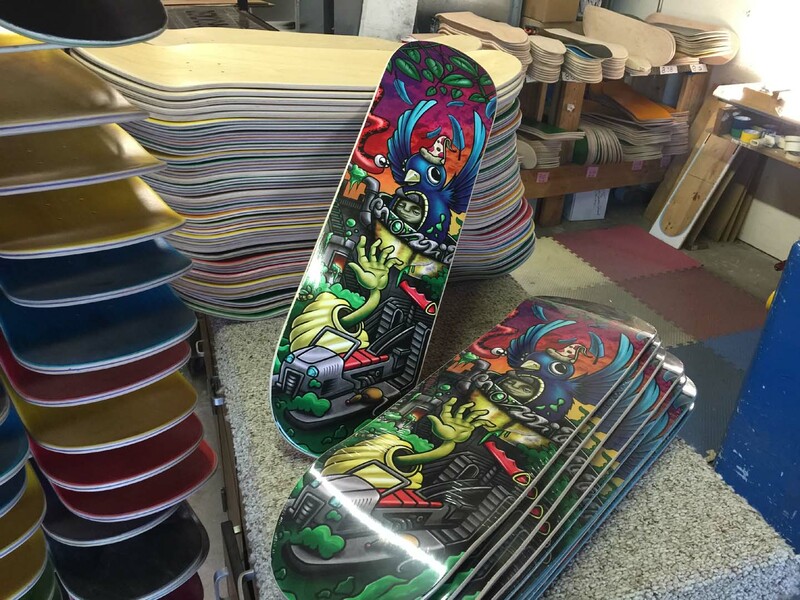 A real skateboard manufacturer will post either on social media videos of their factory at work. Some will try to use videos from their supplier overseas. Just Ask. If you ask if a company actually manufacturers the deck or not they will let you know if they do or not if they are honest. We like to make videos or even walk into the wood shop while customers are on the phone so they can hear the factory at work. A live web cam is a good idea and something we have been thinking about to show that this company is a real manufacturer. Ask if the decks you are about to buy are made in the USA or imported. It would be a really bad idea to make you believe they are made in the USA and give you imported decks. If the company does not say Made IN USA then they are saying Canadian Maple / USA wood. Other counties will buy the Canadian maple and slip in some Russian birch because they look the same but Russian Birch is much cheaper. A USA factory will not have access to lower quality materials. Making decks in the USA there is a direct line from the Great Lakes where the wood grows hard and dense.